Fishing at El Rincon is for both fresh run sea trout to 20+ pounds, and for resident brown trout averaging 3–4 pounds, but with many large specimens in double figures. Sea trout make their way into the Gallegos system around the end of December / first week of January, and continue with strong runs through the season until the end of April and beyond. 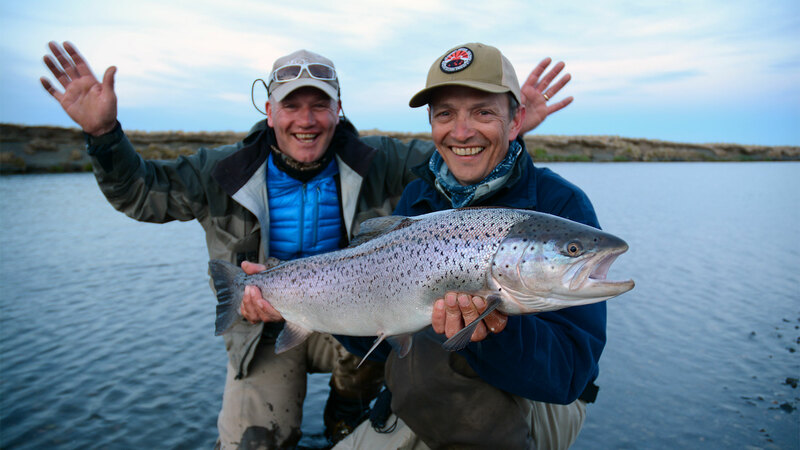 Guests have complete access to fishing on both the Rio Gallegos and the Rio Penitente during their stay. 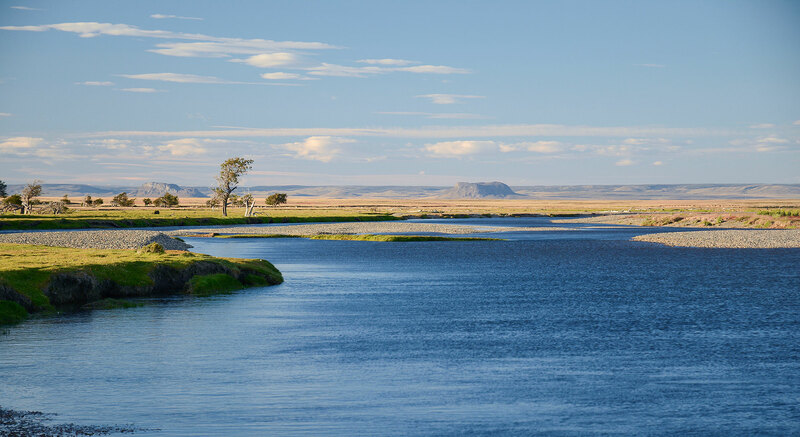 Our 35 km of the Rio Penitente is just a short distance from the lodge. Guests have the opportunity to pick up a rod and walk the few steps across the garden to try a few casts in any of the home pools of this stunningly pretty river. At its normal level the Penitente is best fished with a single handed rod or a light double-handed switch rods. A 7-weight is about right. Lines should be floating/sink tip or intermediate in normal conditions. Slightly heavier sinking lines (S3 or S6) work well during periods of higher water. The Penitente clears and returns to its normal height quickly after a spate. For sea trout in normal conditions most of the Argentinian-style rubber-leg patterns work well here, as do more traditional nymphs. Dry flies can be used effectively in settled and lower water conditions. And streamer patterns are often turned to in higher water or in the numerous cut channels and deep holes spread throughout the river system. 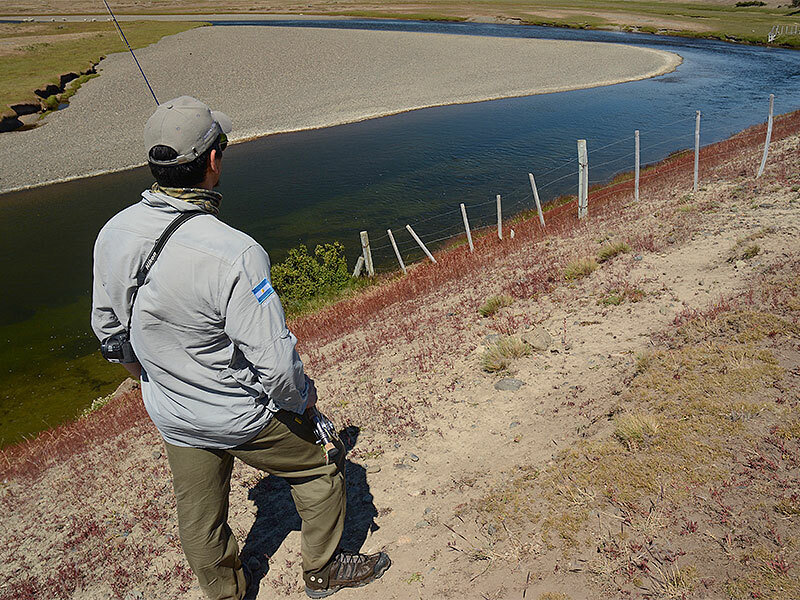 Our private double-bank section of the Rio Gallegos is a short drive from the lodge. In this 20 km reach we have a selection of classic pools holding good numbers of migrating sea trout. Brown trout are also here, but usually we are concentrating our efforts on the sea trout populating the river on their migration upstream. These fish are big! And angry at having their journey interrupted. Be prepared for rod bending action when encountering one of these hard fighting chromers! Rods can be single- or double-hand, depending on personal preference. But we recommend a double-hander around 8-weight matched to an intermediate line for normal conditions, moving to a S3 or S6 line in higher water following a spate. A floating line/sink tip maybe used in lower water, and if the conditions are right, a skated fly can produce explosive results. Our guests frequently enthuse about the excitement of never really knowing what size fish you might encounter next. Consequently, we recommend bringing top quality leader material. Our expert guides use 4×4 vehicles to transport guests to different sections of the river each day. And because of the meandering nature of the river, with its myriad of glides, streams, pots and deep cut channels, time is never wasted driving long distances. Walking from pool to pool in any chosen area is quite easy.